Lake Winnipesaukee Golf Club is a private, 7,017 yard, 18-hole championship golf course that was Bernard Chiu’s dream of the perfect golf course. Years ago, Mr. Chiu had a vision to create one of the best courses in the region so he hired Clive Clark, a golf course architect and one of Britain’s greatest golf legends, to design a golf course near the southern shores of Lake Winnipesaukee. One of Chiu’s goals was to blend the golf course in effortlessly with its surroundings. Each hole was designed to incorporate the natural beauty of the lakes and mountains of New Hampshire and take advantage of the incredible vistas from many of the course’s elevated tees. Even the cart paths and their accompanying fairways were designed in such a way that as you look down the fairway, you do not see the paths themselves. Lake Winnipesaukee has the distinct honor of hosting the New England Open for 2005, 2006, and 2007. This represents the first time that a New Hampshire venue has been chosen to host the event. Working with Sovereign Bank and American Express as sponsors, Mr. Chiu and the New England PGA were able to offer the largest purse of any regional Open in the country. While most top notch golf courses have between 500 and 600 sprinkler heads, Lake Winnipesaukee has over 1,400 computer controlled heads so that perfect fairway, rough and fescue lines can be maintained. The first thing a visitor notices is the white marble sand that was trucked all the way from New York. The bright white traps are set against the bright green fairways to create a spectacular contrast of colors. 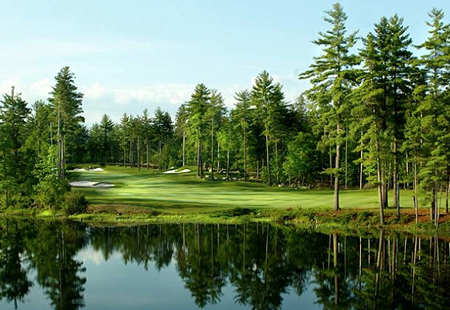 Lake Winnipesaukee is truly one of this country’s finest golfing venues and was named one of the top ten new private golf courses in the country by Golf Digest in 2004. Additionally, Lake Winnipesaukee was named Golf Course of the Year by the New England Golf Course Owners Association in 2007. Lake Winnipesaukee has been consistently ranked one of the best two golf courses in New Hampshire by Golf Digest since 2004.